As the darkness of insecurities gradually disappears and a horizon of post insurgency era appears to usher in a Nigeria of our dreams: a prosperous Nigeria of peace and unity. Nigerians can now boast of the fighting capacity of our military, and glory in the pride of its abilities to fight on many fronts and win. But beyond that, it is imperative to note that the commander makes an Army. No wonder one of the greatest military genius of all times, Alexander the Great once said: “I fear no Army of Lions led by a sheep but I fear an Army of sheep led by a Lion.” Alexander knew that an Army can only be said to be superior if its commander is strategically and tactically superior, as demonstrated by Alexander at Issue, in southern Anatolia, on November 5, 333 BC. It is with this strategic foresight and tactical deployment of meager national resources in pursuit and preservation of nations’ pride respectively by strategically equipped Generals, that nations and civilizations have been saved throughout histories. That is why with every sense of responsibility and humility I have opined that a nation devoid of such generals is a nation without sustainable sovereignty. As I have repeatedly said with respect to the security challenges that have attended our country’s path to greatness: “conflicts and insecurity are as old as liberty”. Conflict is unfortunately one of the inherent liabilities of freedom because with freedom or liberty comes divergence of views and conflict of interests and the resultant crisis and insecurity. So, the liberty espoused by any society and the society itself, are only sustainable to the extent that its institutions saddled with the responsibility of managing the aforementioned inherent liabilities is able to fulfill its obligations. It is therefore, for this reason that nations, empires, civilizations fail and rise throughout history on the backs of superiority or inferiority of strategic soundness of generals. We all knew that all ancient empires: Babylonian, Medo-Persian, Grecian and Roman were built and sustained by Generals’ tactical and strategic superiorities. It with respect to those undeniable truth of history that I have taken keen interest in studying the tactical approaches and strategies of the current leadership of Nigerian Armed Force with special attention to the Nigerian Army. With acute clarity and certainty, I understand that the role of the Army in a time like this and what will befall our beloved country should the Army fails. And knowing that the command and commander makes the Army, I focused on the intent, motivations and tactical approaches of Nigerian Army Chief of Staff, Lt.General TY Buratai. My careful observation has revealed his unrivalled efforts to reposition the Army to meet the demands of the time in all fronts even with the meager resource available to him. 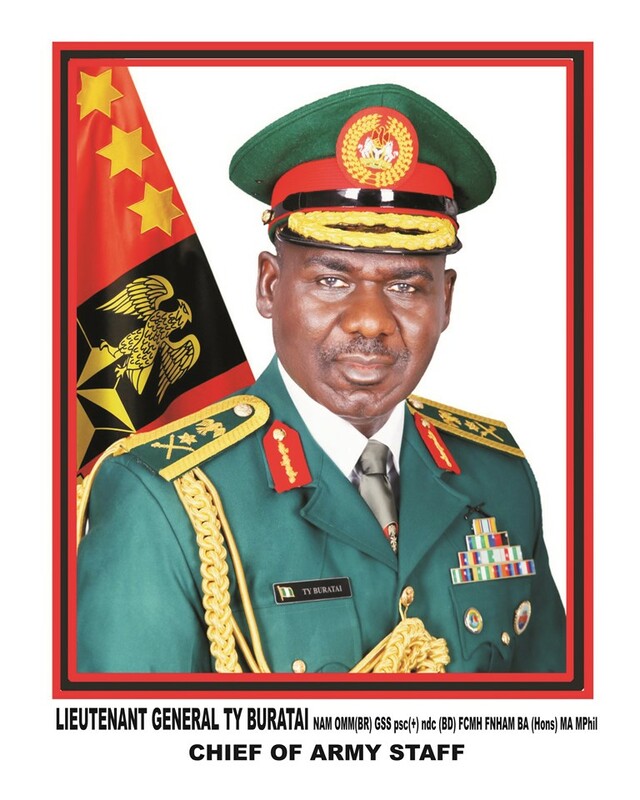 With the lowest military budget when compared to any nation in the world with Nigerian population size, land mass, or facing insurgency, General Buratai fearlessly embarked on the mission of professionalizing the Nigerian Army into a fighting force capable of facing multifaceted challenges from different fronts. He retrained the officers and men beyond the bound of conventional warfare turning them into fighting machines. He created Special Forces units, New Divisions, Brigades and Battalions. He mobilized his troops to flashpoint readiness throughout their locations and ensured adequate troops welfare and high morale. With these strategic masterstrokes, the Boko Haram, ISWA, herdsmen militias, and other criminal elements that would have taken advantage of the just concluded general elections to visit violence on Nigerians were subdued. But not resting in his oars, General Buratai two days ago commissioned the Special Forces command headquarters in Nasarawa where he warned the killer herdsmen and other criminal elements that he is coming for them. 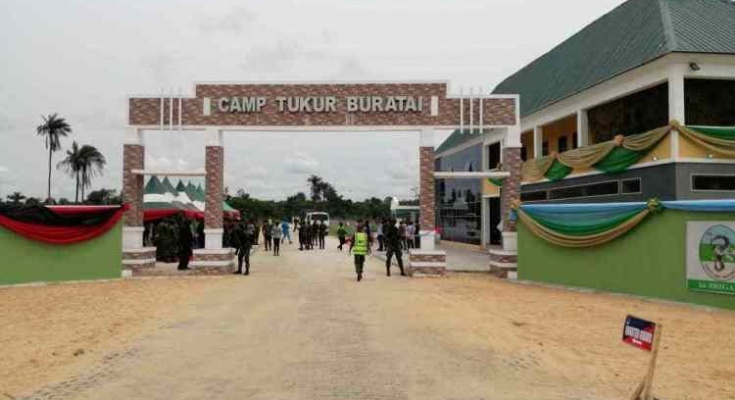 Today General Buratai represented by the Commander TRADOC NA Maj. Gen. AA Salihu, has commissioned the newly completed vital projects in CAMP TUKUR BURATAI, 16 Brigade HQTRS NA in Bayelsa state. The projects commissioned include: the remodeled 16 Brigade Quarter Guards, the Garrison Headquarters Complex, Cpl and below Qtrs, Integrated Med Centre, Wos and Sgts mess, etc in furtherance of his efforts to reposition his troops for quick response across the country. His Masterful strategies of tactical, psychological and locational reposition of his troops coupled with many advanced warfare systems such as the Army’s Digital National Security Monitoring Centre etc that he has established have made it impossible for ISWA, Boko Haram, killer herdsmen, etc to thrive on our turf. One of the greatest strategists of all times, Sun Tzu once said: “so the highest of all military principles is to overcome the enemy by strategy”. When in 216 B.C., an Afrian General, Hannibal of Carthage with an army of about 20,000 troops encountered 72,000 Roman Army led by general Varro, on Roman soil, the outnumbered African general won the battle by superior strategies and tactical positioning of his men and deployment of his meager resources. Like Hannibal, General Buratai has ceased initiative and maintained it in all fronts and has left the terrorists and criminals in disarray and dismayed. Today, we can gladly say that even though the national security threats and challenges are not over and completely solved, we have seen how a sincerely determined leadership can even with the meager resources available achieve so much. Theodore Roosevelt once said: “have you got a problem? Do what you can where you are with what you’ve got”. Yes that is what Lt. Gen. TY Buratai has done with a very low military budget. Some discerning Nigerians have now broken the barrier of political bias to applaud the laudable achievements of Nigerian Army under Gen. Buratai’s leadership, even the professionally clinical conduct of the Army during the just concluded general elections. In this vein, the Bayelsa state Deputy Governor, Rear Admiral John Jonah rtd. applauded the army’s participation in elections security duty and urged Nigerians to stop the baseless blame of the Army for performing its statutory duty of defending the territory of the Federal Republic of Nigeria. 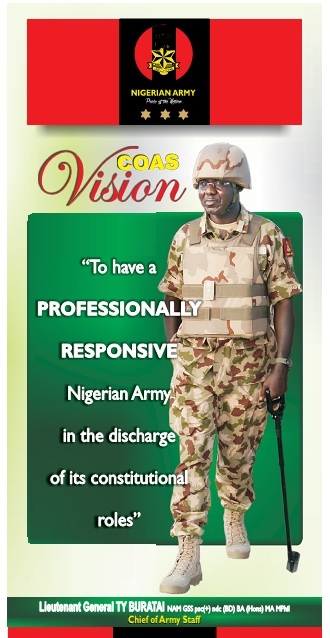 With heartfelt gratitude, we applaud men and women of the Nigerian military, especially the Army. We are forever grateful to General Buratai and his team, for giving the hope for a new Nigeria of peace. We are in debt of your sacrifices and take pride in your valor. History will have you in marble of honour.